The Chair allows us to welcome in each of the thematic programs (semestral or annual), two or three world-famous mathematicians for a one-week to a one-semester stay. The recipients of the Chair give a series of conferences on set subjects, chosen because of their relevance and impact, within the thematic program, the first of which, in compliance to the donor André Aisenstadt's wish, must be accessible to a large public. 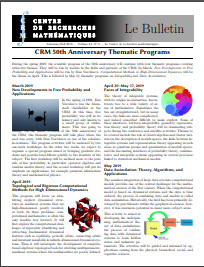 They are also invited to write a monograph in the CRM Monographs Series being distributed by the American Mathematical Society. These Chairs, which brought Terence Tao (UCLA, the youngest Fields medalist at the ICM 2006), Manjul Bhargava (Princeton, Plenary speaker ICM 2014) and K. Soundararajan (Stanford, Ramanujan Prize winner) are unique in Canada. Since 2002, six out of thirteen Fields medalists have occupied, or will occupy an Aisenstadt Chair (Lafforgue, Okounkov, Tao, Werner, Lindenstrauss, Bhargava); five of these Chairs were awarded their Fields medals within two years of their Aisenstadt Chairs, holding our Chairs at the summit of their careers.